The boys have a new pin to add to their lapels and while it looks a regular Georgian shield, it’s actually related to mental health. Phys Ed teacher Adrian Thornbury came up with the idea of the RSGC - coloured shield after being inspired by the indigenous medicine wheel and the concept of “mind, body and spirit”. 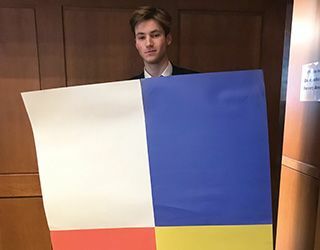 The blue on the shield represents emotional wellness; the white is spiritual wellness; red stands for physical wellness including exercise, eating and sleeping well; while the yellow represents socia wellness - family, friends and community. Over 500 pins were handed out during Mental Health Awareness Weeks and most boys have been proudly wearing the pins on their lapels.